Carter Hart in a preseason game for the Flyers earlier this year. The last-place Philadelphia Flyers—a playoff team last year that has already fired its GM this season—have nothing to lose. And when a team is backed into the bottom of the standings without anywhere further to drop, they start to make riskier and more desperate moves. Today, the Flyers made two—firing their coach and recalling potential cornerstone goalie prospect Carter Hart to make his NHL debut at just a medium-rare 20 years old. The top-line news is that new Flyers GM Chuck Fletcher has canned head coach Dave Hakstol after a weekend of rumors surrounding Hakstol’s job status. The Flyers just suffered through a very rough 0-3-1 trip through Canada that included losses of 7-1, 5-1, and 4-1. Hakstol on the whole had piloted the team through three seasons on the edge of relevancy, but the Flyers currently sport the worst goal differential in the East (-23) thanks to a lack of offense, incompetent special teams, and an extremely poor rotating cast of goalies. Nothing is lost by dumping the coach. Obviously, all eyes turn now to Joel Quenneville as a possible replacement for Hakstol, but personally, I wouldn’t believe any reports until I see him physically on the bench before a game. The other move the Flyers made today—just before the firing of Hakstol became public—is the recall of goaltending prospect Carter Hart from the AHL’s Lehigh Valley Phantoms. Barring the sudden appearance of Quenneville, this is the much more fascinating change, at least in the immediate term. Hart isn’t quite the top goalie prospect in the NHL. Some slightly older guys from the KHL—like Igor Shestyorkin of the Rangers and Ilya Sorokin for the Islanders—are among those who may outrank him in many scouts’ eyes. But Hart is clearly a top-five young goalie, and he has accomplished plenty in his short career on the ice: He absolutely dominated at the junior level to become the only guy to win the Canadian Hockey League’s Goaltender of the Year award twice, led Team Canada to the 2018 World Juniors gold medal, and has put up at least solid numbers in AHL and NHL preseason play. Even if he is just replacement-level in his expected debut on Tuesday, Hart would be an improvement on most of the five goalies to have suited up for the Flyers already this season, whose combined save percentage is a revolting .874. The only guy of that quintet who’s even resembled passable is Brian Elliott, and he’s currently dealing with some vaguely ominous injury issues. There are a couple of reasons for Flyers fans to be nervy about this call-up, however. The more rational one is simply that goalie is a late-blooming position, and exposing Hart to the big time this early could throw off his development, if it’s too much too soon. Born in August 1998, a debuting Hart will be more than two years younger than the Coyotes’ Adin Hill, who’s the youngest goalie to play this year. Rushing a youngster to the pros in what may already be a lost season might look like an indefensible decision if Hart’s confidence gets damaged by a rough rookie campaign. The other reason to be nervous is a bit more superstitious, but these are the Flyers we’re talking about, so it’s fine. 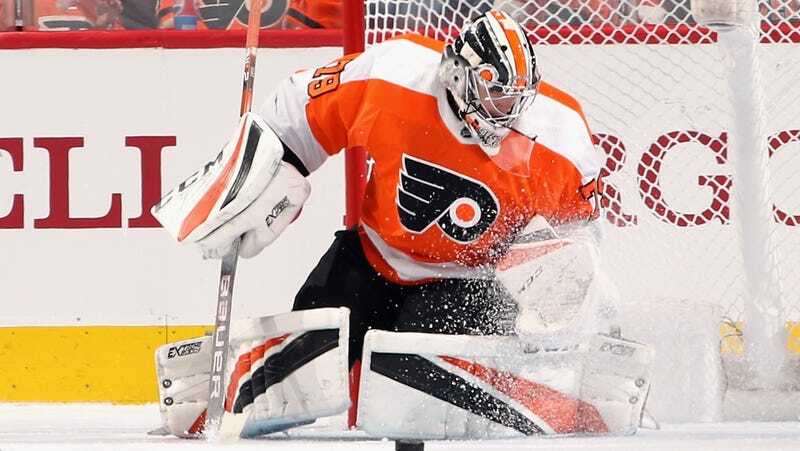 Depending on how you want to classify Steve Mason’s four-year run in net for the club, the Flyers have failed to find a long-term solution at goaltender since the retirement of Ron Hextall in the late ’90s. (This frustration is compounded by the fact that the Flyers drafted and then traded away Sergei Bobrovsky immediately before his Vezina-winning year in Columbus.) Carter Hart is the guy upon whom all the hopes and dreams for the future are currently pinned, which means there’s an especially emotional case to be made for treating him with the utmost care and delicacy. But maybe this is the right time for the team to play this card. The Flyers’ situation currently looks dire, but with less than half of the season gone, they’re only eight points behind the third-place Penguins in a pretty wide-open Metropolitan Division. Starting Hart is a risk, and it’s one the team wouldn’t be taking unless they had exhausted all other options. But a last-ditch effort to save the season is still better than packing it in for 50 games and waiting on the future. At the very least, you now have a reason to care about Red Wings–Flyers tomorrow.